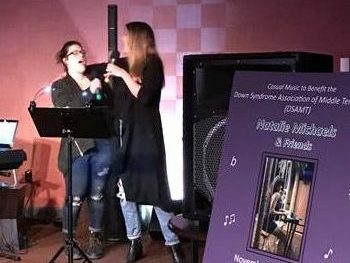 Occupational therapy graduate students Roya Rezadoost and Madeleine Ruff sang a Spice Girls song at a recent benefit concert for the Down Syndrome Association of Middle Tennessee. The concert was hosted by Dr. Natalie Michaels, associate professor of occupational therapy. She also partook in the festivities by performing original songs as well as hits from Whitney Houston and Pat Benatar. Other musicians present included Jim Martin who sang some soft country, including Glen Campbell and songs he’d written, and Rick Michaels, who sang a song by Billy Currington.